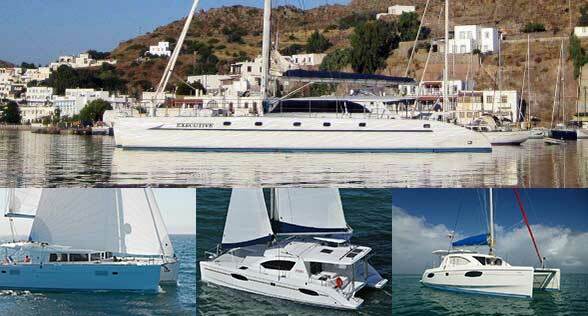 You have found the right place to search for sailing catamarans for sale. To search the database just enter some parameters into the form and click "Search". There are thousands of catamarans for sale here, so you should enter as many parameters as you can think of, and your results will be targeted more exactly. There are sailing catamarans of all sizes and prices below. Please find Catamaran News below for upcoming Boat Shows and more Catamaran News. See more videos on the CATAMARAN MOVIES AND VIDEOS page. Two New Sections have been added to the site. A Catmarans Sold Archive showcases a sampling of boats sold by Gary of boat info with listing and sold price. Updated 9/21/18 Another page of Catamaran Selling Prices features a list of catamarans recently sold around the world with selling prices, etc. 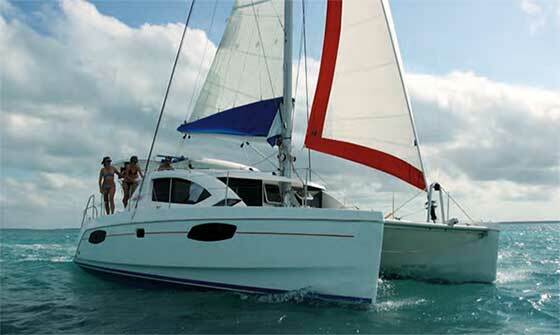 We hope these pages will help you in your buying choice of a catamaran. Contact Gary to help guide your search and buy the right catamaran for you. This is an in-depth look above at a 2009 Leopard 47 Power Catamaran during a survey and sea trial showing details of every part of the boat and some of the items we check on a typical PrePurchase Survey. Commentary by Gary Fretz. See in the above video Gary discusses the effects that hurricanes have effected the charter fleets and the private catamarans for sale. Inventory of the major charter fleets has been decimated. New boat construction has been taken over by the big charter fleets for the next one to two years. Contact Gary for more information to buy wiser for your catamaran. See in the above video Gary discusses his "Top 5 Tips For Buying Catamarans". Contact Gary for more information to buy wiser for your catamaran. News Flash! BLUE WATER SAILING EXPERIENCE AVAILABLE NOVEMBER 16TH-19TH!! Gary is bringing a privately owned 2014 Leopard 39 cruising catamaran to the South Florida area next weekend. The boat is currently located in Marsh Harbour, Abacos and we're looking for a few interested sailors who would like blue water sailing experience. A very experienced captain who loves teaching has been hired. No sailing experience required. Depending on weather you'll hopefully be able to sail the majority of the trip (winds have been great for sailing & predictions are good) or depending on the wind direction and speed you may have to motor some or all. -Thursday 11/16/17 Fly to Marsh Harbour. -Friday 11/17/17 Leave Marsh Harbour in the morning to start the trip to Miami. -Sunday 11/19/17 Arrive in Miami around 6pm depending on weather. - One way airfare to Marsh Harbour, Abacos. There is a flight on 11/16/17 from West Palm Beach airport on Bahamasair to Marsh Harbour 12:20p to 1:20p for $141. This is booking quickly. Reservations your responsibility. -$475 for main suite on the boat with private head (accommodates a couple or single sailor). -Cost for your food and drinks. The group usually share meal preparation and cost. This voyage will provide great blue water cruising experience as well as being lots of fun!! If you have questions, would like more information or interested please call Beth at 305-665-4994 as soon as possible. 40 OPEN FOILER Debuts Yachting Festival Cannes! THE 40 OPEN FOILER debuted at the CANNES YACHT SHOW THIS FALL and I predict will be a big hit. Contact Gary Fretz for more information at bigyachts@gmail.com. Applying an advanced multihull design to a day cruiser concept allows for massive lounging space and extraordinary stability at high speeds in a relatively small package. Naturally balanced, the 40' Open Foiler doesn't require complex stabilizing systems and provides a fast, safe and fuel-efficient ride. The 40 Open Foiler is equipped with dynamic inboard propulsion ranging from 2x425 HP to 2x1100 HP to offer an impressive speed potential of over 60kts. Taking speed to a higher level, the hydrofoil-equipped 40 Open Power H is offered in multiple outboard engine configurations from 2x627 HP to 4x400 HP. 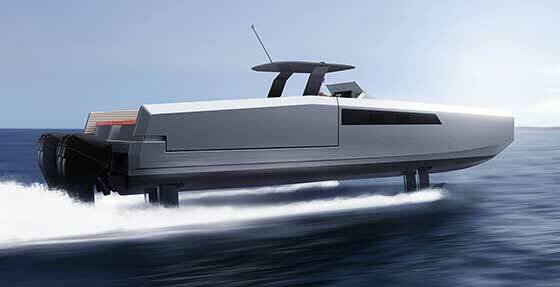 The innovative retractable hydrofoil system lifts the boat above the water when cruising above 25 knots and reduces drag considerably. As a result, the 40 Open Power H can glide above the waves to attain speeds up to 60kts in foil-borne mode. With drag reduced to an absolute minimum, the boat also benefits from extremely low fuel consumption and long range. At the dock or at low speeds the foils retract into the hull. A beamy alternative for classic day boats, the 40 Open Power represents a new level of onboard comfort and the ability to fit more usable space in a given LOA. Two lateral aft folding platforms enhance the already generous living space of the catamaran, creating more room to enjoy watersports. The area below the aft sunpad conceals immense storage to keep water toys and diving gear at hand. The helm, fitted with sporty seats is well protected and equipped with a touchscreen to easily scroll through the boat's systems. The bow-placed dining area uses the beam of the boat to the maximum, providing for maximum versatility with adjustable tables and abundant seating. Depending on the Owner's preferences, this part of the deck can also be turned into a comfortable cabin capable of overnight trips. Large volumes are also available down in the hulls to house a bathroom, an additional stateroom or utility room. Premium audio-video systems and individually selected tech gear, custom upholstery and new layout solutions – the options to customize the 40 Open are limitless. Contact Gary Fretz for more information at bigyachts@gmail.com. We are constantly asked "Why are catamarans so much more expensive in the U.S. than elsewhere?". The video below answers that and tells you how to find the best deals. 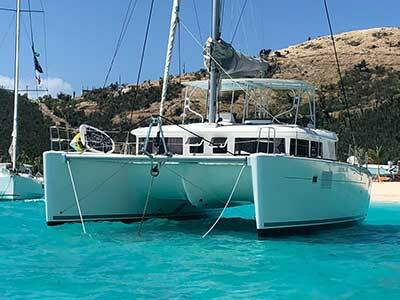 Why are catamarans so much more expensive in the U.S. than elsewhere? See the video below to see Gary interviewed about boat buying and the expenses that come after titled "How much does a boat cost after you buy it? Q & A with Boat Buying Expert Gary Fretz". Hear about the costs of insurance, registration, documentation, taxes, customs importation, dockage, maintenance, survey requirements and Gary's qualifications as a Broker. How much does a boat cost after you buy it? I was available for the Palm Beach Boat Show in West Palm Beach, FL on March 23-26, 2017. This is a great Boat Show with all the boats and displays in one location close to hotels, parking, restaurants, etc. for a really nice Show experience. Contact Me for more info and to see the boats at the Show on your schedule. I was at the Seawind display for Strictly Sail, Maimarina with Yachts International selling new Seawinds and used cats at Booth: P3-11. Four Cats Sold in One Month! 2007 Lidgard 73 Sailing Catamaran. 4 staterooms/5 heads. This was a distress sale and I am happy to share pricing with anyone who Contacts Me. 2012 Lagoon 450 4/4 in excellent condition for only Euros 313,000. Because the dollar has been rising against the Euro this US buyer paid $336,000 in dollars...this was an excellent deal for the buyer! Yachts priced in Euros have been good "buys" lately since the Euro has been weakening against the dollar. I have one more like this and it won't last long. 2011 Leopard 38 (4/2). This cat was in excellent condition with a new Livingston 10' dinghy and sold for $182,000 with US Duty Paid. 2013 Leopard 39 Owners Version. This like-new catamaran sold for $299,400. If you would like to know what other cats have been selling for just Contact Me and tell me what make(s) and model(s) you are interested in and I can tell you exactly what they have been selling for. Also, List Your Cat with me to get her sold fast.